During the three-day trip, the delegates enjoyed a packed programme in Silicon Valley, including the awards ceremony, brunch with Breakthrough founders Yuri and Julia Milner, tours of the headquarters of Facebook, YouTube and Impossible Foods, and a special Breakthrough Prize Symposium. Here’s the trip in pictures. The trip begins with a welcome dinner at Ambience restaurant in Los Altos. Generation T honourees Joel Neoh, founder of Malaysia-based mobile payments platform Fave, and Aaron Lee, founder of Hong Kong-based property and travel-tech companies Dash Serviced Suites and BlackDoors, prepare to dine. Gen.T delegates toast the forthcoming few days. Back row from left: Steven Kim, co-founder and CEO of Indonesia’s fastest growing food discovery service, Qraved; Joel Neoh; Arrif Ziaudeen, founder of Singapore-based restaurant booking platform Chope; Sean Fitzpatrick, chief content officer and managing director at Edipresse Media Hong Kong. Front row from left: Khailee Ng, managing partner at venture capital firm 500 Startups; Aaron Lee; Terence Kwok, founder of Hong Kong hospitality tech startup Tink Labs. The Gen.T delegates bond and enjoy a lively start to the three-day trip at Ambience restaurant. From left: Aaron Lee; Oceana Ou, general manager of commercial at Edipresse Media Hong Kong; Kathy Gong, co-founder and CEO of China-based gaming company Wafa Games; Tamara Lamunière, head of Generation T Asia; and Stephanie Lee Sy, founder and CEO of Philippines-based data science consultancy Thinking Machines. Yuri Milner—tech investor, philanthropist and Breakthrough Prize co-founder—makes a point during a special brunch at his home for the Gen.T delegation. Kathy Gong and Arrif Ziaudeen look on with interest. The Gen.T delegation explores the grounds of Yuri and Julia Milner's California residence. From left: Oceana Ou; Kathy Gong; Joel Neoh; Mark Ngai, stylist and partner of pop star and Generation T honouree GEM, who performed at the awards ceremony; Danny Yeung, co-founder and CEO of digital health company Prenetics; Michel Lamunière, CEO of Edipresse Media Asia; Julia Milner, co-founder of the Breakthrough Prize; Yuri Milner; Steven Kim; Tamara Lamunière; Terence Kwok; Aaron Lee; Leonid Solovyev, director of operations for The Breakthrough Prize Foundation; Khailee Ng; Arrif Ziaudeen; Stephanie Lee Sy; Sean Fitzpatrick. The Generation T delegates line up on the red carpet at the Breakthrough Prize awards ceremony. From left: Joel Neoh; Stephanie Lee Sy; Steven Kim; Oceana Ou; Sean Fitzpatrick; Aaron Lee; Tamara Lamunière; Arrif Ziaudeen; Michel Lamunière; Khailee Ng; Kathy Gong. Actor Orlando Bloom on the red carpet. Fellow Hollywood luminaries Eddie Redmayne, Thandie Newton, Lupita Nyong'o, Ron Howard, Rachel McAdams and Pierce Brosnan, who hosted the ceremony, were also in attendance, along with singer Lionel Richie, who performed on the night. Mark Ngai and Danny Yeung pose for photographs on the red carpet. Mark Zuckerberg and Priscilla Chan, co-founders of the Breakthrough Prize. Other Silicon Valley doyens in attendance included fellow Breakthrough co-founder Sergey Brin, the co-founder of Google, as well as the CEOs of Uber, YouTube and PayPal, to name just a few. Dame Jocelyn Bell Burnell, who discovered pulsars in 1967, gives interviews on the red carpet ahead of receiving her 2018 Special Breakthrough Prize in Fundamental Physics award at the ceremony. Yuri Milner speaks to the press on the red carpet before the Breakthrough Prize awards ceremony. Eddie Redmayne leads a tribute to Stephen Hawking at the Breakthrough Prize ceremony, joined by Yuri Milner and Lucy Hawking, the late astrophysicist's daughter. Arrif Ziaudeen at the headquarters of Facebook during the Generation T tour. The Gen.T team pose for the camera during the Facebook HQ tour. Back row from left: Oceana Ou; Michel Lamunière; Joel Neoh; Khailee Ng; Aaron Lee; Tamara Lamunière; Marie-Charlotte Bulté, high jewellery department co-ordinator at Chopard; Arrif Ziaudeen; Kathy Gong. Front row from left: celebrity photographer Crazy Rouge; Sean Fitzpatrick; Sofyann Salah, high jewellery private sales manager for Chopard; Steven Kim; Caroline Scheufele, co-president and artistic director of Chopard; influencer Melissa Zuo, guest of Chopard. The Gen.T delegation leaves Facebook’s headquarters and marches on during the packed three-day programme. 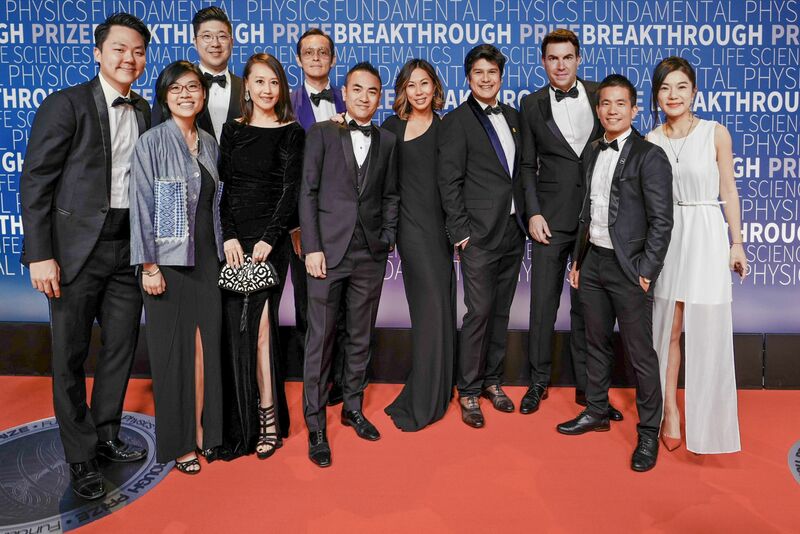 Those visible from left: Kathy Gong; Sean Fitzpatrick; Arrif Ziaudeen; Michel Lamunière; Tamara Lamunière; Joel Neoh; Sofyann Salah; Aaron Lee; Melissa Zuo; Christian Reuwer, of the Breakthrough Prize team; Oceana Ou; Steven Kim. Steven Kim is pleased with his hearty American fare at Buck’s restaurant. The delegation toured the YouTube headquarters in San Bruno. Joel Neoh and Khailee Ng share a moment in front of one of the most famous logos in the world. Kathy Gong poses for the camera at YouTube HQ. Dr Pat Brown, founder and chief executive of plant-based “meat” maker Impossible Foods, talks with Sean Fitzpatrick and Khailee Ng during Gen.T's tour of the company's Redwood City headquarters. The delegation pose for a photo during their tour of Impossible Foods HQ. From left: Tamara Lamunière; Kathy Gong; Oceana Ou; Michel Lamunière; Joel Neoh; Dr Patrick Brown; Steven Kim; Stephanie Lee Sy; Sean Fitzpatrick; Nick Halla, senior vice president for international at Impossible Foods; Khailee Ng; Christian Reuwer. The Breakthrough Prize Symposium at the University of California, Berkeley featured a lively panel discussion with noted theoretical physicists. Topics included “Is time travel possible?” and “Is there life in the universe?” On the panel, from left: Derek Muller, symposium moderator; Aron Wall, research scientist at the Stanford Institute for Theoretical Physics; Daniel Jafferis, associate professor of physics at Harvard University; Daniel Harlow, assistant professor of physics at the Massachusetts Institute of Technology; and Nima Arkani-Hamed, professor in the School of Natural Sciences at the Institute for Advanced Study. After an informative, inspiring and entertaining three days in California, the Generation T delegation enjoys a farewell dinner at Chez Panisse in Berkeley. From left: Joel Neoh; Arrif Ziaudeen; Stephanie Lee Sy; Michel Lamunière; Khailee Ng.